it hasn't stopped raining here for over a week. it's kind of depressing! I would much rather snow, especially so close to Christmas. 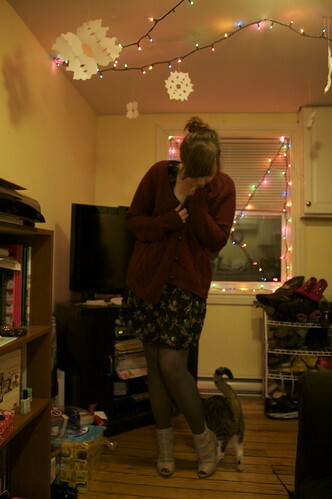 snow would also make it easier to take outfit pictures. pouring rain and ugly grey surroundings is very uninspiring; I have no motivation to go out in the wet, cold street at 8am with a camera and a tripod. I tried some indoor shots, which also didn't work out so well. but I tried! at least you get a glimpse of my decorating? pretty kitty! I think he secretly wants to be on camera. he doesn't usually pay this much attention to me. 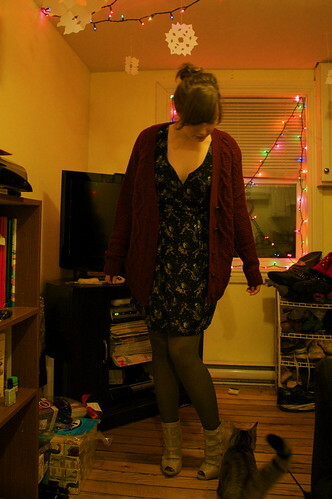 this gorgeous dress was my first Christmas present! 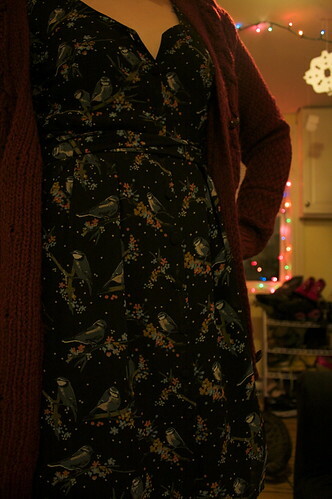 (hi Caitlinnn) I love the bird print! so cool and unexpected. and whimsical, which is a quality I've been liking a lot lately (ie, Alice in Wonderland necklaces). I like that it's light enough for summer but kind of a wintery print... which is why I thought it would look good with a heavy knit sweater. I think I'll be sending the sweater back, though. I like everything about it, and it's super cozy, but in the picture it looked RED and not... burgundy. 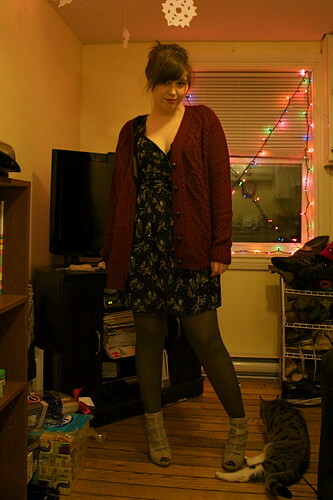 I already have a burgundy cardigan that I like very much! plus, this one is huuuuge. maybe a size smaller, and in green, would do nicely. and don't worry, I only wore the sweater for these pictures, then took it off, so I'm not wearing & returning! 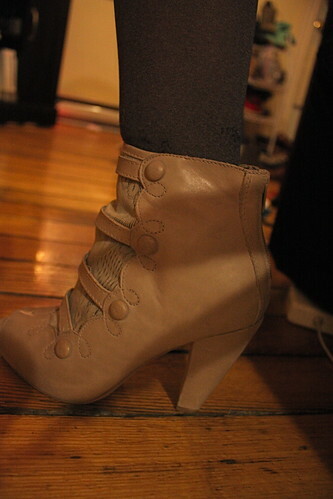 I want to talk about my adorable new shoes too, but I'm tired and I've already written too much. I'll try to be more interesting very soon! right now, sleep sounds better. i love the colour of that cardigan! it looks so cozy, too bad it's not what you wanted. oh well! and i can't wait for it to finally snow so i can get some outfit pictures with some snow in the background! i love love love your cardigan! so big and comfy!